"3LA1, V-365" by Timothy K. Perttula and Robert Z. Selden Jr. CONTEXT INFORMATION: From a grave excavated by Dan Jenkins in April 1929. DECORATION: The rim has horizontal brushed-incised lines. On the body are a series of very narrow and diagonal appliqued ridges, with diagonal brushing marks between the ridges. Belcher Ridged, var. 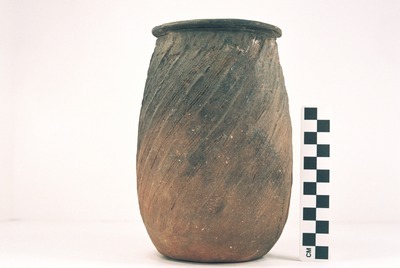 Belcher Ridged jar (5425-744).